Keeping Your Electronics Clean Doesn't Have To Cost A Bomb | Ever wondered how to keep your sensitive electronic and electical equipments clean without having to send them to an expensive specialist centre? Whether you're thinking of your printers and copiers, precision instruments like power drills, controls, circuit boards, switches or other sensitive electrical equipments, there's always a specialist you can get to work on them, without having to spend tonnes of money. 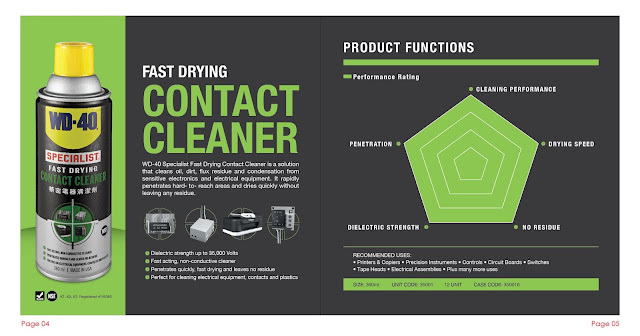 We're talking about the WD-40® Specialist™ Fast Drying Contact Cleaner. But before you pick up the can, always remember to switch off the electrical equipment you want to clean and let any hot surface cool down prior to the cleaning process. Once the equipment is ready to be cleaned, just apply a thorough spray of the WD-40® Specialist™ Fast Drying Contact Cleaner and then leave it for a few seconds for the magic to work and you're done! It is totally quick-drying, so it won't leave any residue. It is great for cleaning oil, dirt, flux residue and condensation. The solution works rapidly and will penetrate the hard to reach area thoroughly. You can use the WD-40® Specialist™ Fast Drying Contact Cleaner on any electrical equipment or contacts with dielectric strength of up to 35,000 Volts per 0.1 inch. You may also use it on fuse blocks and electrical connectors. Just spray it on the connectors generously and make sure it's completely clean before inserting it back into place. 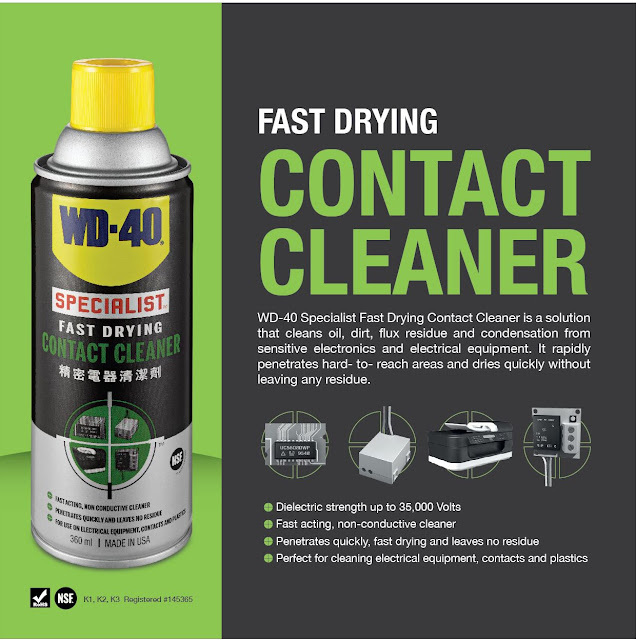 So keep your tools clean and working longer with the WD-40® Specialist™ Fast Drying Contact Cleaner. This handy DIY cleaner will definitely save you plenty of time and money in lower overall replacement costs.